Oh, boy, were the holidays busy! Of course, everyday life is busy year-round, but I think most people would agree that November and December are even crazier. And with the addition of New Year’s resolutions or new words for the new year, it’s hard to know how to get everything done that we want to. In my attempts (because I still wasn’t wholly successful, but, hey, I tried, and that counts for something, right?) to slow down and rest, I implemented some small changes in the name of redirecting my energy towards more important things and hopefully saving my sanity in the process. These things allow me to spend less time on tedious things that get under my skin and instead pour more into things I want to be focusing on, like loving myself, God, others, and life in general. Even in their small ways, these little changes make life better! They’re especially helpful in recouping from the chaos of the holiday season and getting back into a normal routine. I write nearly everything down. To avoid panicking about having forgotten something, I’m trying to get in the habit of writing everything down (and doing so in a logical place). I have many lists in the Notes app on my phone for that very purpose– a long-term shopping list, a home improvement list, a blog post idea list…and the list goes on. I add things to my lists as I think of them so I won’t forget. I keep a pad of paper on hand at work, too, to jot down things I need to get done, things I need to pick up from the store, and things I want to do when I get home. It frees me up to then focus on the task at hand because I know I committed it to paper (or virtual paper) to take care of later. I unsubscribed from email lists that weren’t doing anything for me. Sure, I like to get coupons for stores that I actually shop at regularly, but for others, I can always look up a coupon if I decide to go at the last minute. Without getting bombarded every week with emails I won’t make use of. That’s a win in my book. I started working on blog posts farther ahead of time. Having to compose, elaborate upon, revise, revise again, and publish a post at the last minute (read: any time the day it’s “due”) is stressful. I do much better if I’ve at least gotten half the post written before the day I plan to publish it. It usually works best if I have multiple half-written posts in my arsenal so I can choose what to finish based on what I’m feeling most passionate about writing. I unsubscribed from some blogs in my Feedly account. 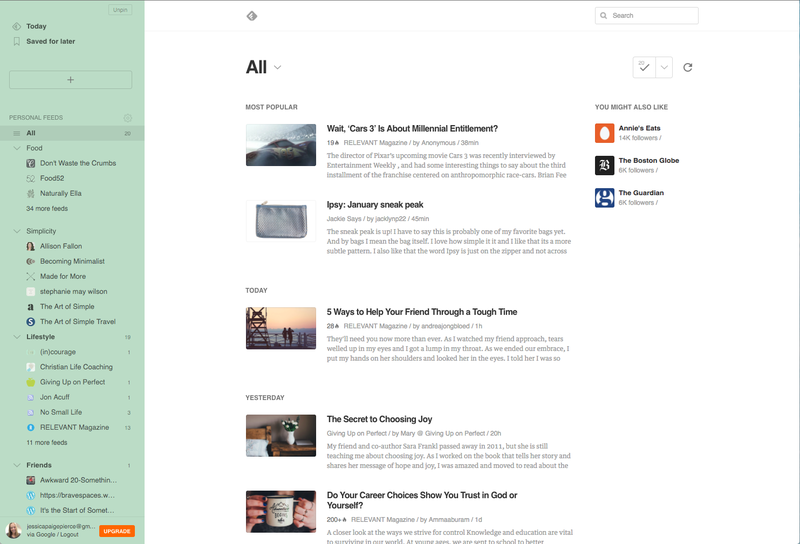 I love Feedly because it allows me to read my favorite blogs in one place, choosing which stories I want to read, which I want to skip, and which I want to save for later. But I had followed too many, and every Monday found myself feeling overwhelmed with the hundreds of stories that had accumulated since Friday. I gave it some thought and decided to remove some of the blogs and news sources from my list to give myself a better-curated list of things that I’m more interested in, thereby saving time and effort deleting things I hardly ever read anyway. I started using PepperPlate to plan my meals. I like that I can create a plan to make certain meals on certain days and have the recipes right there in the app or on the website version. I had been using Todoist to plan my meals along with all my other tasks, but I always had to open the website to double-check the shopping list, and PepperPlate allows me to add items to my list directly from the recipe. 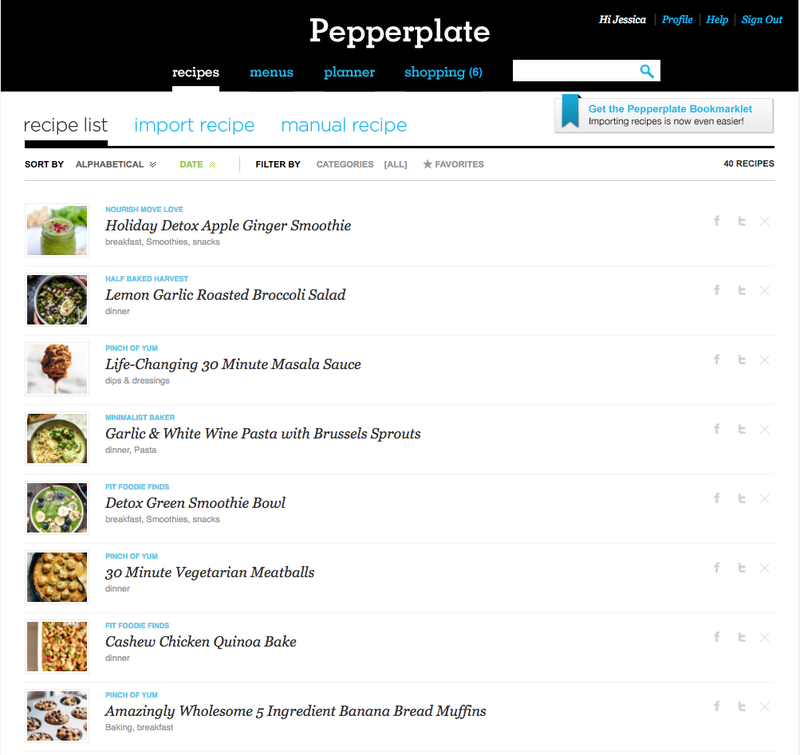 There are some websites it doesn’t support, so I’ve had to add some recipes manually, but that’s not all that difficult, especially with the PepperPlate bookmarklet for Google Chrome. I’m still trying it out, and I still use Todoist for other tasks, but I’m working to figure out what will make this whole meal-planning process more efficient and less labor-intensive. I have thousands of recipes saved in a Google Sheets document online, but those take longer to look through, don’t include the photo, and require me to input more information. I still like my master list, but PepperPlate has quickly become a good tool to have. I’ve been trying to make my daily rhythms more purposeful, and that requires making little processes more efficient so I can focus on the bigger things, like living like love. Has your year gotten off to a good start? What sorts of things have you been doing to save your sanity?